To my surprise, Jack wanted to do an early morning run. We ended up running more than 5.7 miles through the city to Vondelpark. We circled the park and then ran back to the hotel. A map of our run is here. We had breakfast at the hotel for the second straight day. Thankfully, the Fedex package is now in the system and shows up in Germany. Packing up the room, we walked to the train station. We caught the 11:17 am high speed train to Antwerp. We had a nice conversation with an American couple along the way. The leg was about an hour and 15 minutes. The Antwerp train station is architecturally interesting. We switched to an intercity train to Bruges. Making about six stops, it took another hour and a half. We got to Bruges about 2:30 pm and caught a cab to the hotel. We are spending two nights at Dukes Palace. Janie had stayed here a couple of years ago and recommended the hotel to Sharon. To Jack and my surprise, we have a large multi-level family suite. After getting settled in the room, we headed into town. With too many people trying to decide which way to go, we had a ragged start. From there, we wandered through the Burg Square and ended up somewhat accidentally in the Basilica of the Holy Blood. Built in the 12th century as the chapel of the residence of the Count of Flanders, the church houses a venerated relic of the Holy Blood allegedly collected by Joseph of Arimathea and brought from the Holy Land by Thierry of Alsace, Count of Flanders. Belgium is known for its beer. We wandered to the beer wall at 2be. We had a sampler and watched the boats on the canal. 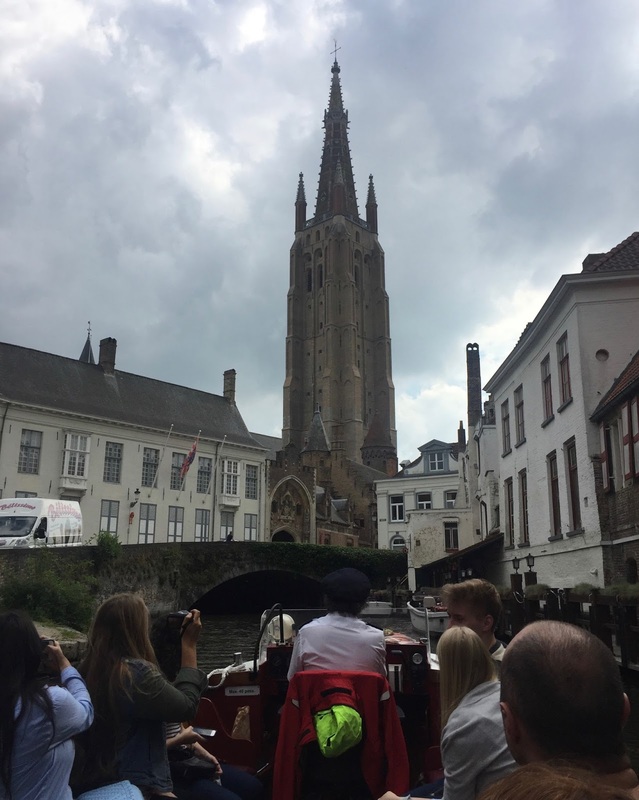 Afterwards, we took a boat cruise of Bruges. This was a much more intimate experience than Amsterdam. We stopped on the Market Square for a cold drink and a snack. Jack wants to climb the Bell Tower tomorrow. We crashed in the hotel room for a while. Sharon and I wandered down to check out the hotel bar before dinner. Eventually, we went to dinner at Breydel De Coninc about 8:30 pm. Sharon and Jack had mussels with white sauce, while I had mussels with Bruges beer sauce. We split an ice cream desert. The food was very good. We struggled to get the check when we were ready to leave. Sharon and I have experienced this in past trips to Europe, but this may have been one of the more bizarre episodes. I swear the waiter was purposely ignoring us! We walked back to the hotel in the pouring rain after dinner; we didn't bring jackets with us. We crashed a little after 11:00 pm. The earliest that we have gotten to bed so far on the trip.